It's Sunday (again), kids watching What now (again), I am still sitting here in my nightie (not photogenic!!!) and I just feel very frustrated! A million things I need to do and somehow I don't feel I am making much progress! If you don't want to listen to my whining and whinging, just skip this post! If you want to see more pics instead, click on the Quilts tab, I have updated it and added the more recent quilts. I saved it the right way around, why does blogger import it sideways? So why am I actually frustrated??? 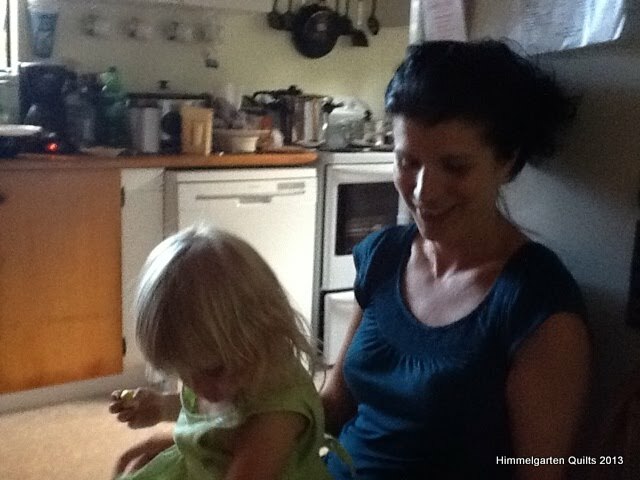 Most the kids I get on well with now, most of them can't wait to come to the classes of my colleague and I (she does carving with them at the moment, some beautiful work coming out of there!). The few who decide to be eggs I can work around. My own kids are pretty good at occupying themselves as long as I ignore the fact that more often than not there is a screen involved. While we had to let the cleaner go (we're hoping to save for a trip to Germany for July 2013), my DH vacuumed and washed the floors on Friday. I haven't gotten any sewing done, but I am counting down to my first ever quilting retreat next weekend, and my lovely DH is even building me a portable sewing table for that. For school education, I truly believe in the future of e-learning - wherever, whenever, at your own pace etc. - and I am getting a chance of trialling some this term. So why am I still frustrated??? * I have so many ideas of what I would like to be doing, but I simply don't have enough time! I still haven't finished the thermofax design I had wanted to send off to Leslie to burn. 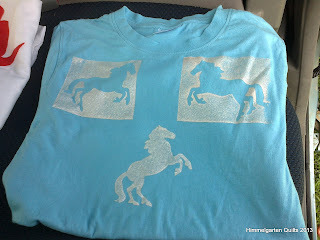 I haven't finished the screen print t-shirts and pillow cases for my own boys. I want to print some t-shirts for my nephews in Germany as I missed our summer sales and I really need to send some prezzies over. 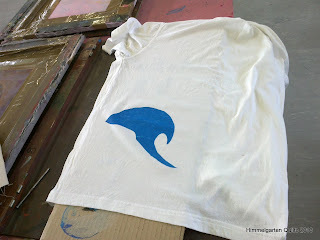 Oh yes, I had also wanted to print some tea towels for the newly married son of a friend! I want to get into painting fabric. I need to scrub my developed screen and re-develop it using the black light bulb I bought in the holidays. * I am quite disheartened by the lack of access to 'stuff' - from the next LQS which is an hour away, to specialised stuff which you might or might not get in NZ to clothes to public transport (none) to music concerts to choice of schools to selection of clothes. * Regarding work, I have many frustrations: Yes, the money is good in comparison to other jobs in our region. The hours to do it well are horrendous, and I definitely didn't put in enough time in the holidays. Is the education we offering our students really good enough? I work very hard and I run a pretty good programme, and yet I feel other staff are working a lot less hard, their programme might be of lesser quality and yet they are getting away with it? I originally trained as secondary teacher for Music and German (which no one teaches up here). I have worked intensively in pastoral care for students at risk, but in our current school system the job opportunities for my skills and experiences are very limited. Now I teach Art, and while I am not an expert, I can make it work at that age level. I teach Music - fine. 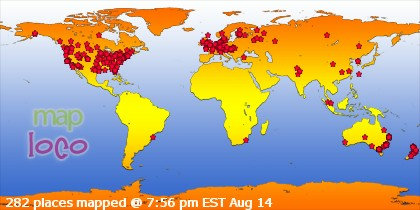 I teach Computing - something I really like and can make work. BUT: Out of the blue I come across things I am not allowed to do etc. without anyone telling me beforehand - you would think that either you are or you are not in charge of your programmes! If I was one of my friends who has to listen to me whine about work, I would probably see a pattern of 'Monika is never happy with wherever she is teaching'. So where should I turn, what should I do? DH has lately been suggesting to re-train for primary teaching (one year mainly online course), but my colleague advised against it simply for the amount of work involved to teach well at primary level. I need to earn a decent salary though, oldest DS goes to a private school which we believe is the best place for him, and possible the younger ones will follow (our choice of good schools is somehow limited here). I think one of my biggest problems might be a kind of perfectionism, I want to do really well at what I am doing and I expect others to wanting to do so, too. I somehow feel like a Jack of all Trades, but I do nothing really well. I dabble in heaps of different things - a bit. There was this saying when I was at uni that mediocre musician become music teachers. I listened to an interview with a classical conductor on the radio recently, I got quite nostalgic about the time when I was heavily involved in music. Teaching is actually the one strand that goes through all the things I have been doing in my life so far - I used to tutor class mates at secondary school, teach the flute while at uni, taught at various schools since coming to NZ 15 years ago as well as in a parenting programme. 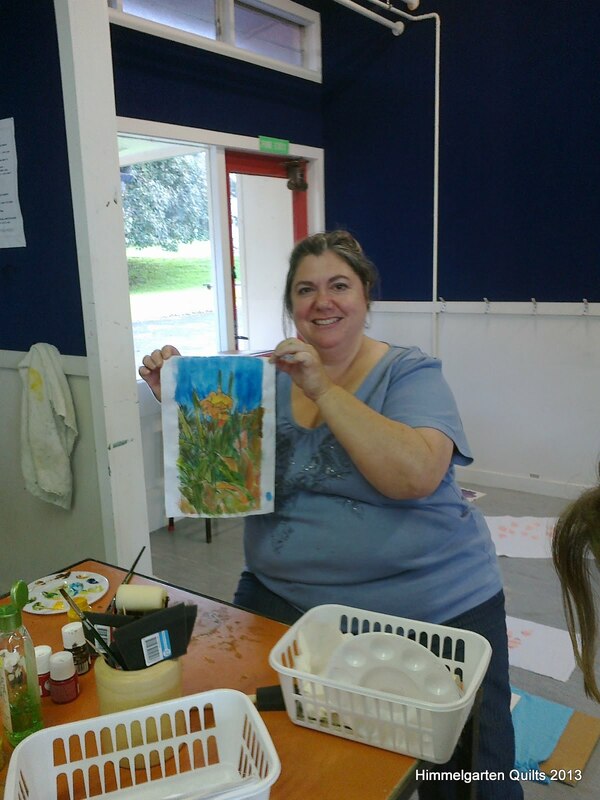 I would really like to get more into teaching adults in arty stuff, but there is little opportunity for this in our local area. 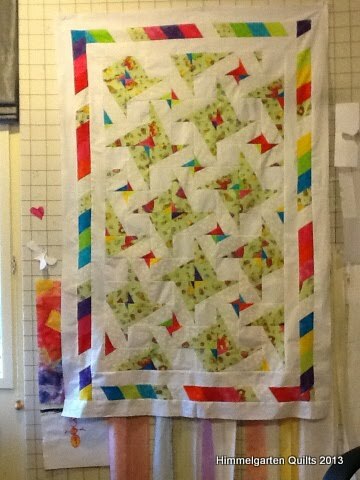 I have been following Leah Day's Sunday posts of getting into Quilt Biz, maybe they are going to give me some ideas. So now that I haven gotten this all off my chest, I better go back and get some more of my school work done! I'll try to take pics at our retreat next weekend. 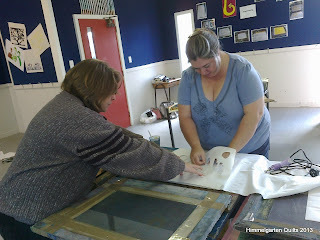 Towards the end of last year, Suz and I visited Carolyn, The Powerquilter. Amongst other things I bought a Batik Charm Pack. 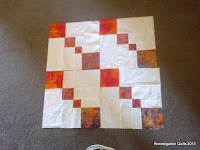 I really wanted to do something with these, so I tried out the Double Disappearing Nine Patch as seen on A Few Scraps. Initially I toyed with the idea of using black to go with the Batiks, but I stayed with white on white instead. 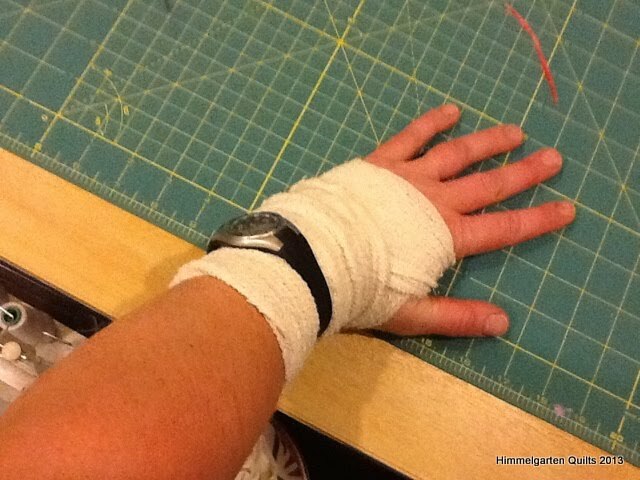 For batting I chose cotton/bamboo from Stitchworks which I found wonderful to work with. My very clever oldest DS (11y) asked if I could continue the pattern to make it a Triple or Quadruple Disappearing Nine Patch - and it worked! 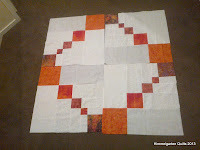 Lovely Rona from Layer Upon Layer did the maths for me in her comment, click here if you would like to find out what size starting squares makes what size triple or quadruple D9. 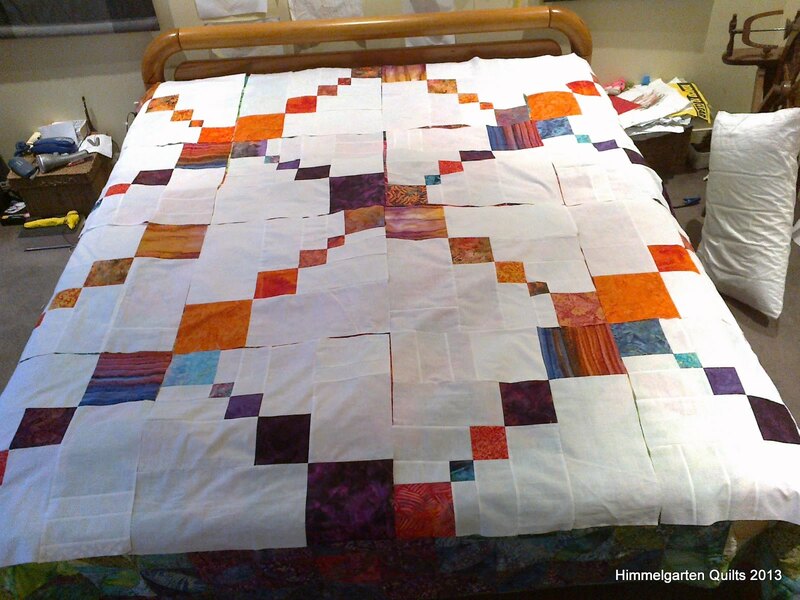 At 21 1/4" each the 16 blocks were simply too big for a single bed (originally I had planned this to be Storm's quilt), so they had to go onto my NZ Superking Size bed and I discovered in the process that this is 71" x 80", smaller than the King Size 76" x 80" from The Quilter's Pocket Reference Guide (what would we do without Wikipedia?). I have been following Leah Day's Freemotion Quilt Along and in the process learnt a lot about stippling - I have even practised!!! This has really helped me with stippling behind the feathers to make them come out better. For the batik squares I simply stitched in the ditch and added the diagonal. For the white areas I used Gueterman Cotton thread, but I was disappointed how many times the thread broke - my machine seems to like Aurifill Cotton better! 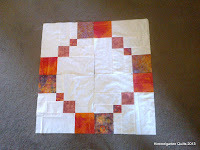 Early on I had decided that this was the quilt to learn to do QAYG - I really liked Mari's method on The Quilting Edge. 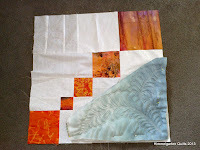 I used joining strips of white on white backing from Stitchworks (very reasonably priced and still good quality, unlike some of the other backing fabrics I have come across! 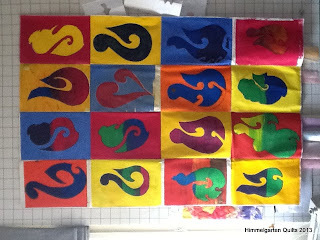 ), and for the back or the blocks a large square of batik each. I was held up slightly when I ran out of white on white - I had forgotten to count the front joining strips twice as Mari recommends to use a strip folded in half. As borders I added another sashing strip all around plus more batik squares (looking through my stash I can see I have to make another batik quilt, I just love them and there are plenty!). I had cut the white on the back 3/4" larger than the front so I could fold it over the front and machine stitch it down as binding. And now it's finished! 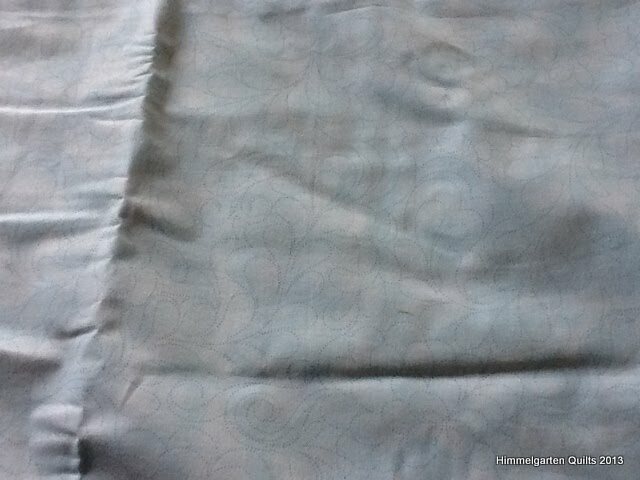 At 98 1/2" square, the cotton/bamboo lets it drape beautifully across my bed! Now the rest of the bedroom needs to match it (maybe I should give it an 'autumn clean' lol). 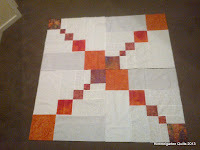 Jill from The Quilt Rat has posted about the ATC swap on The Quilting Gallery. That sounds like fun, so I thought I'll join up for this. 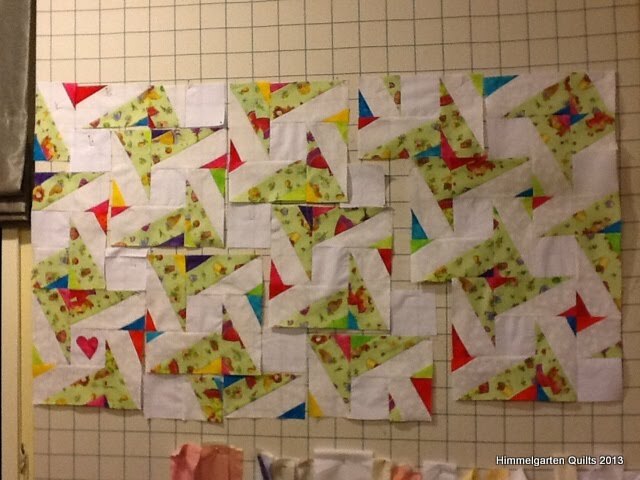 Retreat Projects: So far I am thinking about (finally) continuing with my pastel tessellations (only 400 squares to go I think... sew them together, cut them apart at an angle and sew them together again. Then join the four resulting rectangular pieces via QAYG. Add borders with more tessellation, this time from a jelly roll. 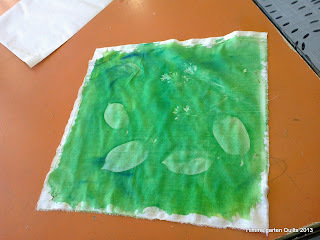 Then applique on top - I think this won't be a finish for May! 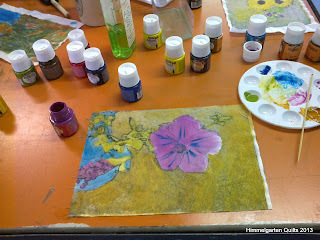 Another Retreat Project: ATCs for the swap, using Rona's painting method, or sunprinting?! Do I really have to go back to work tomorrow?! My sister and BiL bought her a big bed because she keeps on waking herself up in the cot or in the travel cot when they are away. Well, the big bed had its own challenges, a different size to the regular beds so the new mattress didn't fit etc. Her txt from yesterday said she put Storm down for her afternoon nap in the big bed for the first time, Storm decided to play and rearrange her room for an hour until she put her into the cot where she fell asleep straight away lol. Somehow I'm glad that we're out of that stage! After I had made my Pinwheels which I turned into a table cloth, there were heaps of left overs in the most gorgeous colours. 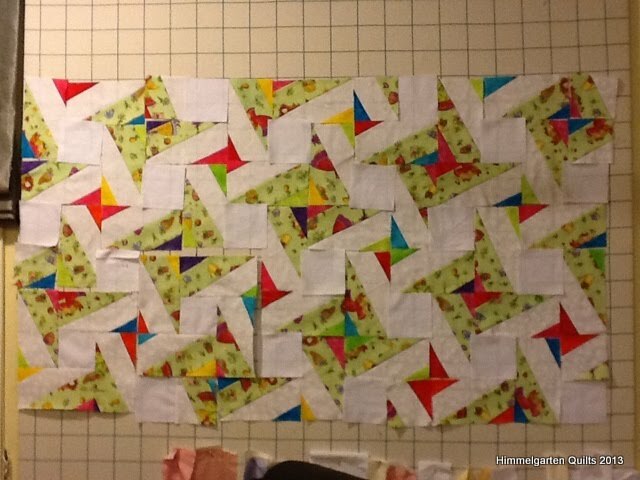 I chose triangles in green plus a solid and white and a solid and pieced them into rectangles. These were cut to 3 1/2 x 6 1/2". After playing with them for a little while, I decided to arrange them in a tesselating pattern. The resulting blank squares I filled with white 3 1/2" squares from the sheeting material I want to dye. 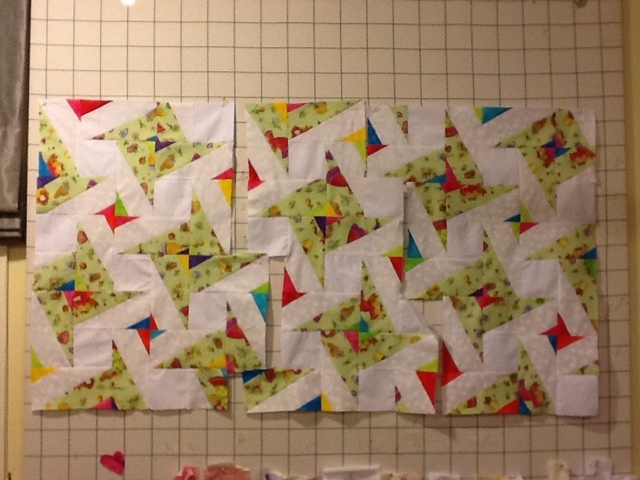 Lovely Suz helped me sort out how to piece the tesselating pieces to minimise partial seams. 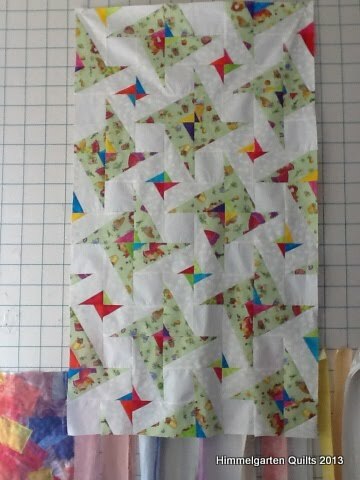 The completed tesselation section was fairly small, so first I added a 2" white border, then from my pinwheel scraps I cut 2 1/2" strips of pieced jellyroll strips (if you remember, the pinwheels were constructed from 5 strips cut at 60 deg angle). 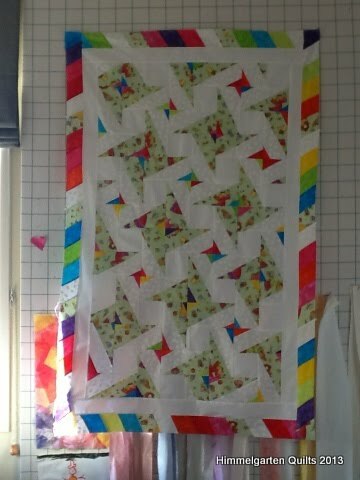 This still wasn't quite big enough, so I added another white 2 1/2" border. Next I took the remaining scraps apart to get as many 2 1/2" squares as I could - I had to add some in from the white sheeting but they blended in well. On top, I appliqued flowers and hearts on the white squares and her name on the top of the quilt - Tada! 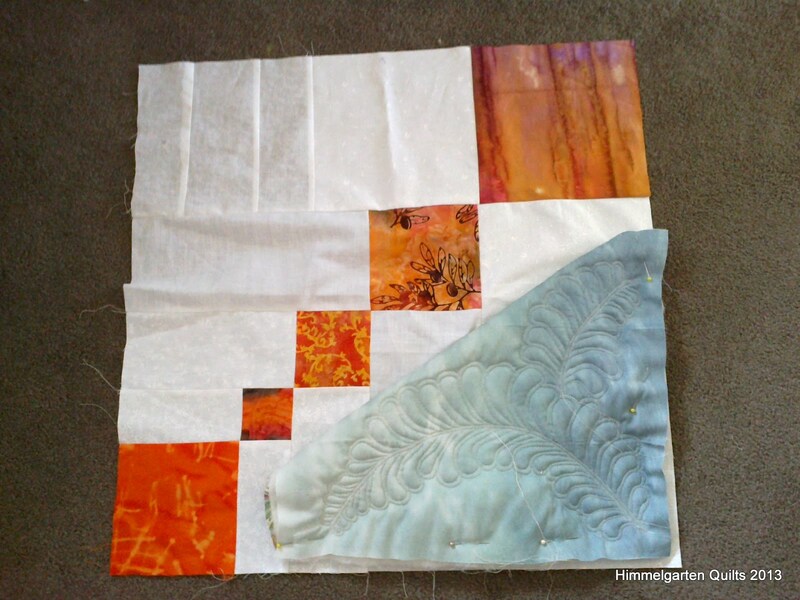 For the quilting, I knew I wanted to get away from stippling and from feathers. 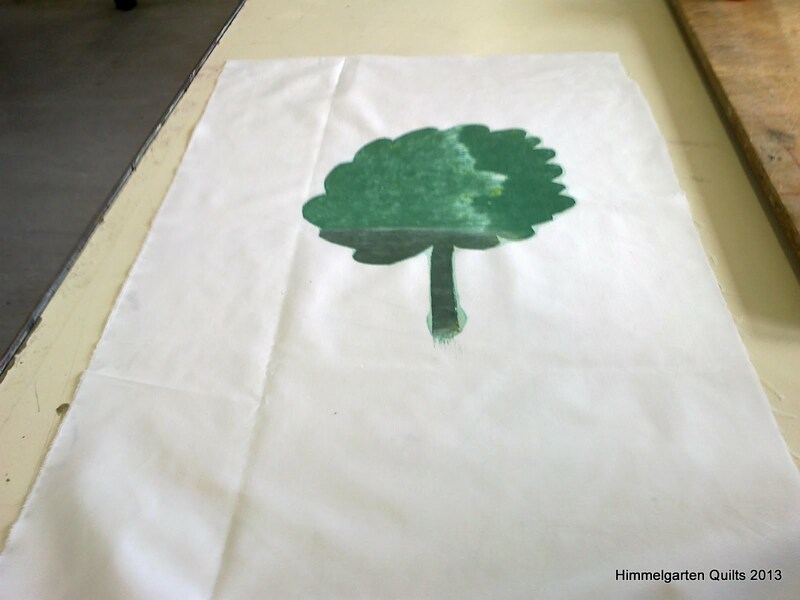 On A Few Scraps, Christina had shared branching designs for quilting. So after laying out the backing with loads of pins in the carpet and sandwiching it with polyester batting and the pieced top, I started quilting a small creeping vine with leaves and swirls. In retrospect I should have put it in my Flynn Quilting Frame, my last few projects were smaller and / or QUAYG and not with polyester which has little 'cling'. 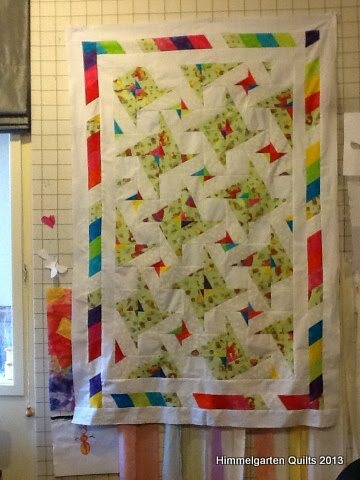 No puckers on the back, but some 'bubbles' in the front not helped by the fact that I quilted in all directions. It's not something I would put into an exhibition, but I still love it and I am proud to give it to Storm! In the meantime I will design some patterns fror Lesley from Silkscreen Maker http://www.silkscreenmaker.com/ to burn onto Thermofax Screens - have a look at her site, thermofax screens are very easy to use. I'll add her details to my Suppliers' Page. Later on today we're off to Whangarei for another appointment with oldest DS, also need to get to Auckland this week to pick up the new babysitter aka xbox360 kinnect. I better get sewing now to make the most of time! 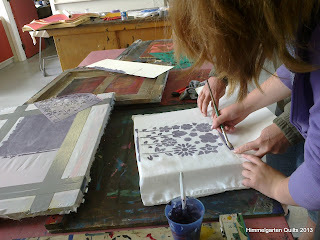 Rona, I never took a photo of your printed fabrics, can you put some up on your blog to share, please? 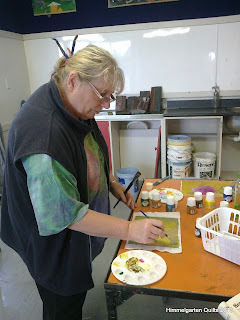 Rona had also brought her fabric painting supplies and showed us the method she had used for her painted quilts - that was amazing! 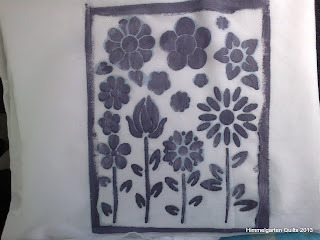 Painted with a translucent fabric paint wash, then put in the sun with leaves and some weeds on top - magical! So where to from here with Screen Printing??? Please bring fabric, T-Shirts, pillow slips, tea towels or similar to print on, as well as old clothes, an apron, optionally gloves and your morning tea / lunch. I really like how it has come together, the wonkiness of the pinwheels is sort of reflected in the wonky applique flowers and hearts. 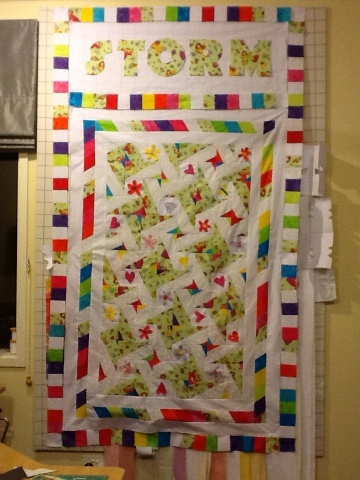 I will have to decide tomorrow of the name goes up on the top or down on the bottom end pf the quilt - anyone with a preference? Firstly, apologies for the funny editing incl. photos out of order and / or repeated. My work laptop which I usually use for blogging has gone to laptop hospital so I am using the iPod / iPad blogger app instead and it's just not quite the same sorry!!! Good Friday brought sunshine finally, so DH, two DSs and I started tidying up the garden. We deheaded some of the agapanthus along the driveway and got a whole compost bin full! DH has been building a dam to give us a large pond at 'the bog' aka stream, and I even helped him nail the bridge together! 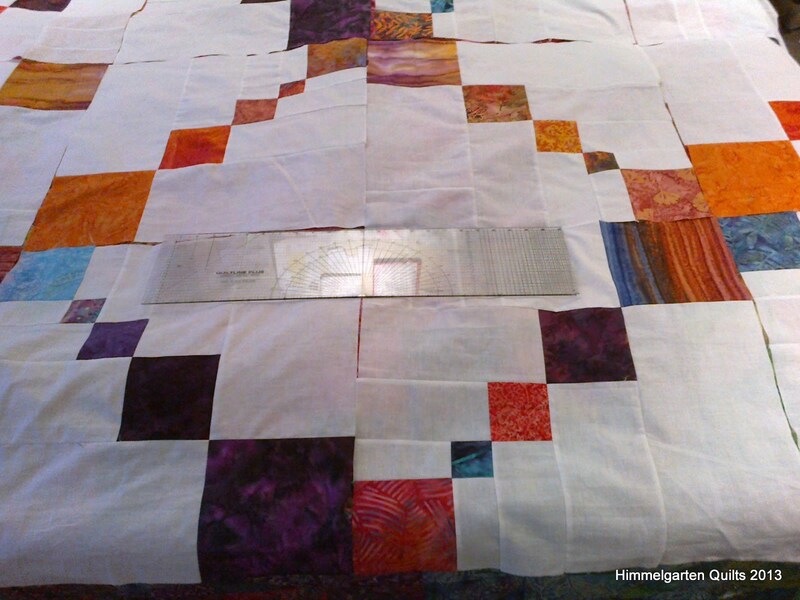 For today I plan to cut 2 1/2" squares from the remaining leftovers which I'll piece one row for a border on the sides and multiple rows for the top and bottom (will see how many I end up with). There is enough room to do a white strip top or bottom onto which I'll applique her name I think, plus some more hearts, flowers etc. For the back I bought some material the other day which has an all over quilting type pattern printed - maybe I should follow that pattern, from the back?! But what would I do with the applique, or do the quilting first, then applique and blanketstitch over the top of the quilting?!? Any advice much appreciated! First thing I did today after I got home was order some dyes and more screenprinting supplies lol I think my hubby has the hope that we'll tidy up the garden and the house in the holidays (he is off as well), but I'll have to get some time to play, too! you are welcome to join into some messy, arty fun (not sure about the order of these two adjectives!!!) at Kaikohe Intermediate School, 11 Park Rd, Kaikohe. Bring white, pre-washed fabric (preferably cotton), or pillow slips or T-shirts or canvas or tea towels etc., an apron, gloves if you wish to wear them, and your morning tea / lunch. I will provide paper / card for stencils, screens and squeeges, screen printing paints as well as hot drinks. I have made some workbooks for my students this term which can take you through the process, or you just get right into it. Please make a donation towards the screen printing paints. Plese let me know no later than Wed 11 April if you want to join in (so I can get some more paints if we need them). Add some applique to the white squares and a few borders and hopefully it will go to her!